A little while ago I did a round robin email to specific folks that I know who are concerned or who are involved in the cuts protests going on around the country. It seemed to me that we needed to think of a way that we can protest without switching people off and being associated with violent confrontation, whilst at the same time getting in people's faces and making an impact. In effect cutting through the stereotypical perception that the general public have of us crips and putting an end to the apathy that seems to grip people in times of crisis, including many disabled people. We have a huge resource in the shape of a large disabled artists community. We should be able to utilise this talented group and come up with some pretty unusual ideas with which to attract the general public to our cause. At the same time we should be able to provide a vehicle that those disabled people who haven't yet become involved could identify and join in with. One of the best demos I've seen involved environmental protesters dressed in black, moving slowly through the streets one evening carrying large canisters. They all eventually converged on one of the large oil companies HQ's and proceeded to dump the oil they had in the canisters on the doorstep of the building. Nothing was said and the protesters remained expressionless. Then they all turned around and walked slowly away in all directions. This had such an impact and was covered by the press and television in full the next day. Imagine several hundred (dare I say thousand) disabled people all gathering at one point and all doing something so imaginative that it would make the whole country sit up and take notice. It doesn't have to be elaborate; just different enough to grab people's attention. Well, I wasn't disappointed. My inbox is still gets several responses in it every day and they are still coming in. So the time has come to try and get all of these ideas out for further discussion; which is why I've created this blog. The plan is to winnow out the main ideas and put them up on a further blog here for further discussion. We'll eventually end up with a group of ideas that we all feel confident with and that we can start to recruit crips to implement up and down the country. 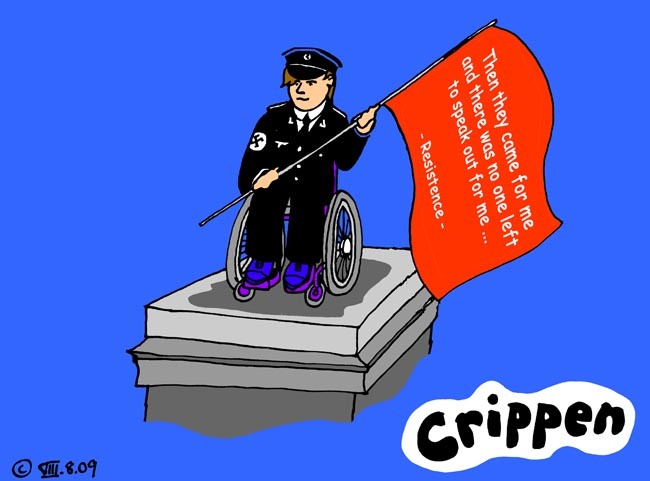 The cartoon, by the way depicts fellow disabled artist Liz Crow appearing on the Anthony Gormley plinth in Trafalgar Square on Saturday 8th August 2009. She presented a dignified but powerful statement against extreme right wing politics in its worse manifestation. This was also an example of how disability art and disabled people's protest could come together and send a strong, clear message to the rest of society. 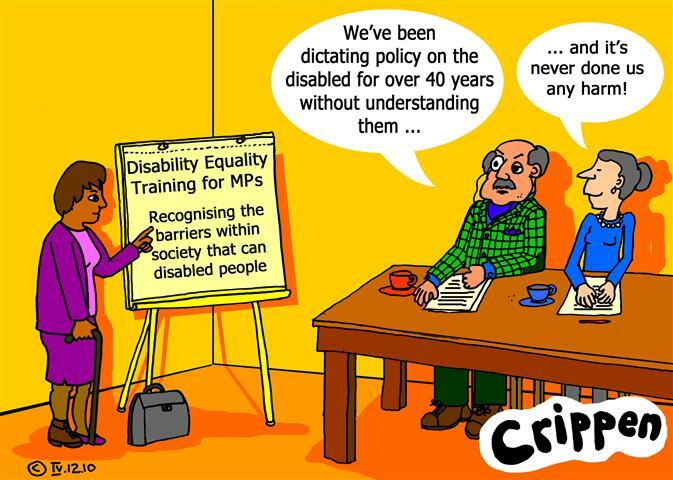 Do government ministers need disability equality training? 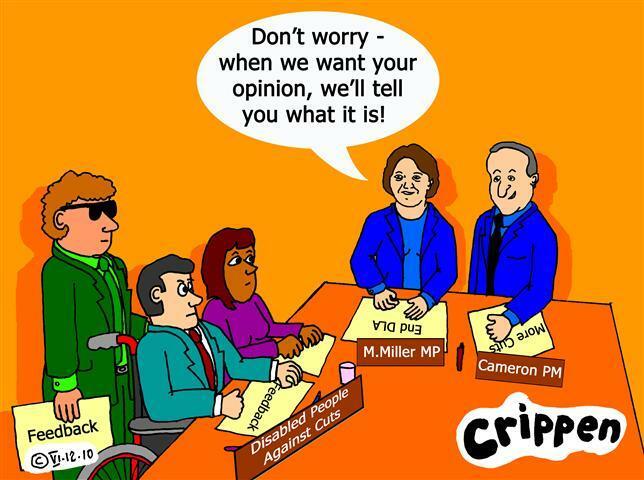 "Do government ministers need disability equality training?" That was the question asked by a member of the public at an all party parliamentary group on disability earlier this week. It's surely a sign of how disabled people's trust in the government agenda around this issue has broken down that someone even felt it appropriate to ask this question - even if it was slightly facetious! Lord Freud, minister for state for welfare reform, was present to discuss the government's benefit reform agenda with MPs and members of the public. Apparently, according to people at the meeting Lord Freud didn't seem to appreciate that ESA was aimed almost solely at disabled people and that Contributory ESA is only open to disabled people when he insisted that disabled people would be protected against these changes. This apparently caused several people to ask if he fully understood the issues?! Vern Pitt, equalities journalist commented: "There are elements of disability benefit reforms which are sensible and easy for disabled people and the sector to get behind. No one would argue the form for disability living allowance should remain huge and complex, or that there needs to be better employment support for disabled people. "But the way the government has handled it, in a rather blunt manner (often pandering to the right wing press' depiction of those on benefits as scroungers), has made it untenable for most to get behind these aims." Disability Alliance, the disability organisation which focuses on benefits, was quick to point out that the consultation on disability living allowance reform is only running for nine weeks, not the usual 12. It is measures like this that make disabled people rightly suspicious of the motives for change. Vern added: "All the little things add up. The lack of information, the lack of consultation and the subsequent lack of clarity are making it hard to find a solution that both the government and service users can support. Worse still it's clearly beginning to make disabled people question if the government even know what disabled peoples lives are really like!" Commenting to me by email, disabled activist Alan Wheatley told me: " As a lifelong disabled person, I have long suspected that those who give the order have no idea what my life (as a disabled person)is like." You're not the only one Alan!